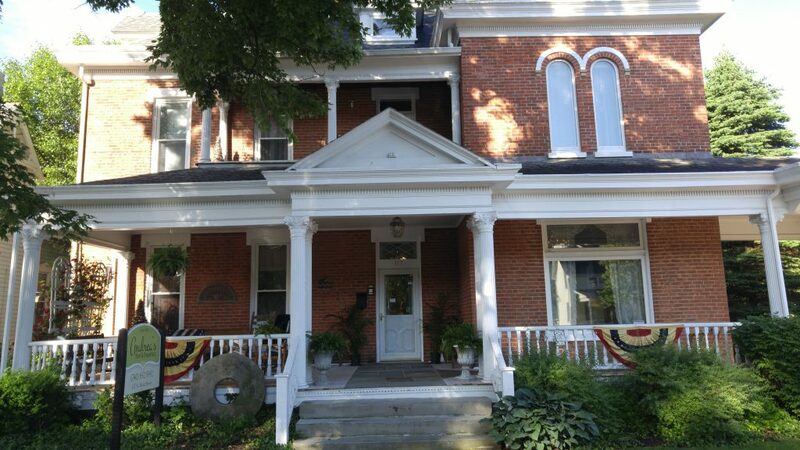 The day began where it ended last night at Andrea’s Bed and Breakfast in London, OH. I was the last to bed because I had been working on the blog and tried to do as much advance packing as I could. I was also the first one up in the room I shared with 2 other guys in “hostel 2”. Breakfast normally started at 8. 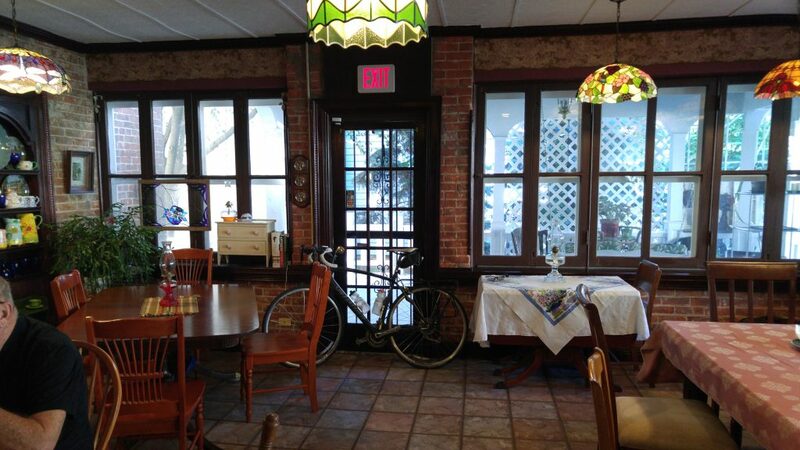 When I told Susan, the owner that I would like to be on the road by 8, she led me to the kitchen and showed me some quiche, muffins, and a banana that would be waiting for me before the regular breakfast. 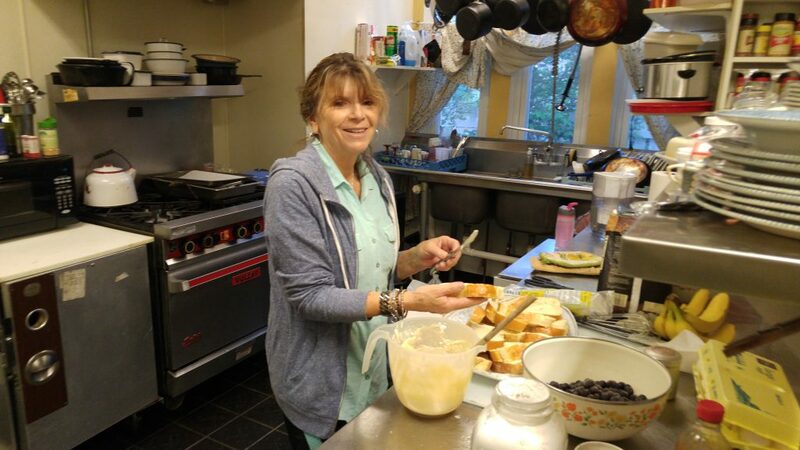 When I wandered into the dining room at 6:45, she was already at work in the kitchen preparing sausage balls and some very unique and tasty french toast. Susan Lockhart was already working on some killer french toast. I am not going to give away all her secrets, but it was topped with a frosting made from cream cheese and butter, baked, and finished with blueberries on top. 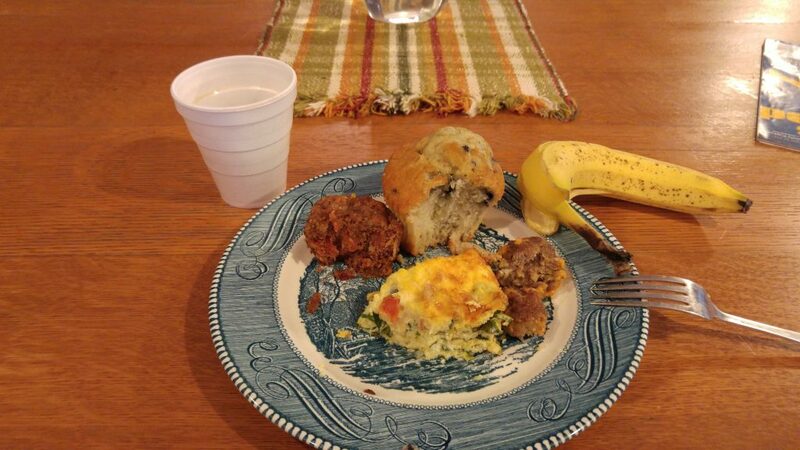 I had my quiche, muffins, and banana. I suppose the french toast could have counted as second breakfast after I had this! 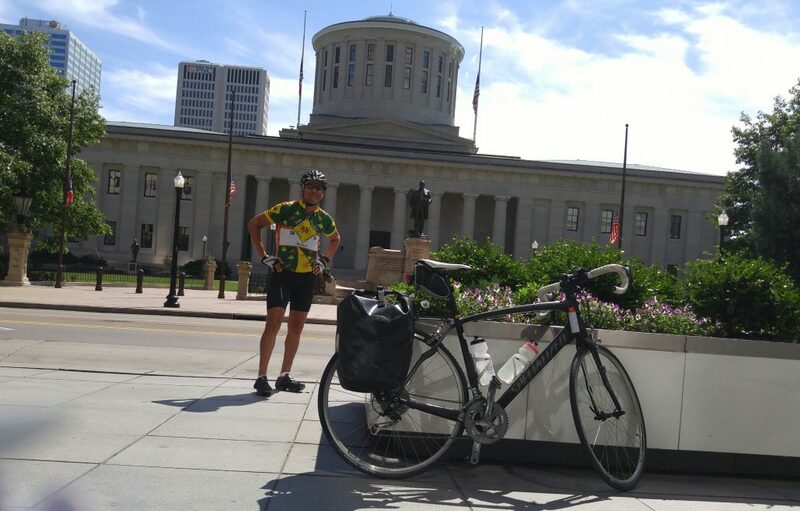 I had a delightful conversation about medical careers (my daughter, Erin, is a doctor) financial planning for retirement, biking, and life with David Conger over breakfast. Before I left, Susan had brought a slice of the French toast. All I can say is if you are ever within 80 miles of London, OH, you have to come to her place. By the time I was ready to leave, the rest of the 2 other biking parties were up. We wished each other safe travels. We had already shared some fine scotch, tales of the bike, and life lessons the night before. Loaded up with the breakfast part of my bed and breakfast experience, this was going to be one of the rare days when I wasn’t thinking about 2nd breakfast. I stopped at 12 miles to pick up a milk. The 2 cookies that Susan had sent with me needed the proper pairing. One victim was a pumpkin chocolate chip and the other was some kind of spice cookie with dried fruit. They needed milk and never saw the outskirts of Columbus. Since it was Memorial Day, many of the places were closed downtown. It made it harder to find something to eat, but easier to negotiate through such a large city. I enjoyed their riverfront and there were lots of people jogging, walking and riding along several paths. It seemed like I had not ridden through so much urban area since the first day of the ride in California. In reality, Wichita, Columbia, Springfield, and Indianapolis were all pretty big. 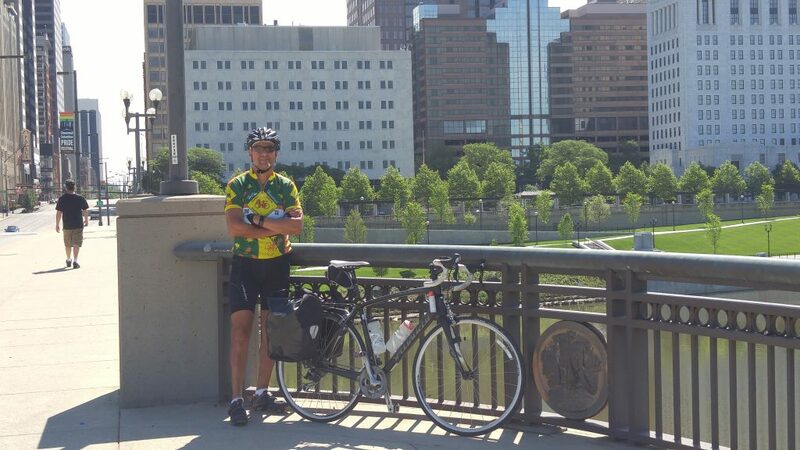 Indy is very similar to Columbus, but I went through the entire city of Columbus west to east, where I had only gone through half of Indy. After I stopped for lunch on the near east side, it seemed like I was stopping for a lot of lights as I got back on US 40. 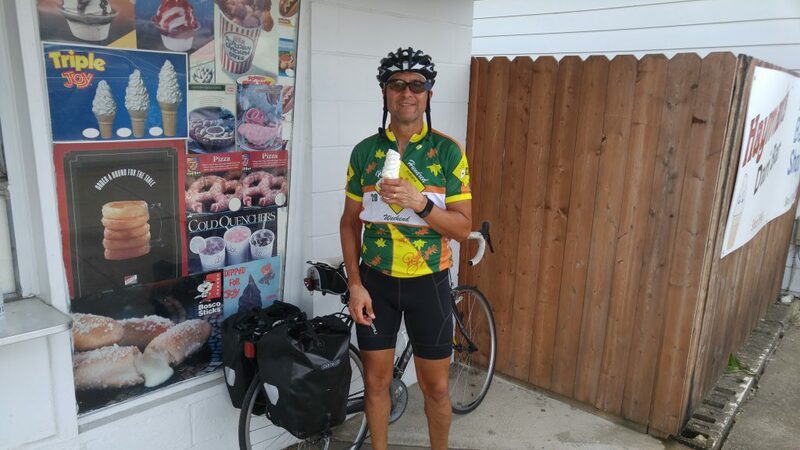 I got my ice cream fix in Hebron, 26 miles from Zanesville. 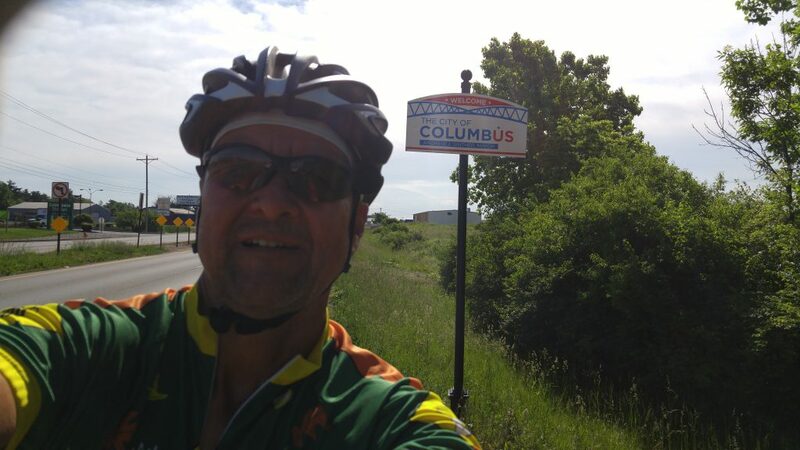 The lights were a little less heavy as I made it to the outskirts of Columbus. 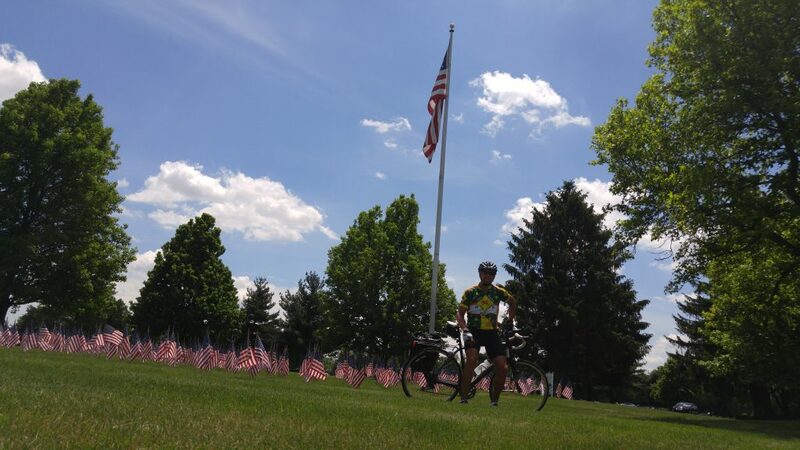 At Glen Rest Memorial off the road was a large display of small US flags around the larger flag pole. There were people decorating graves. I had forgotten that today was Memorial Day. I don’t care much for jewelry. I had to be convinced to wear a ring when I got married almost 35 years ago. However, on this trip I have worn 2 items around my neck. One is a St. Christopher medal and the other is my Dad’s dog tag from his service in WW II. 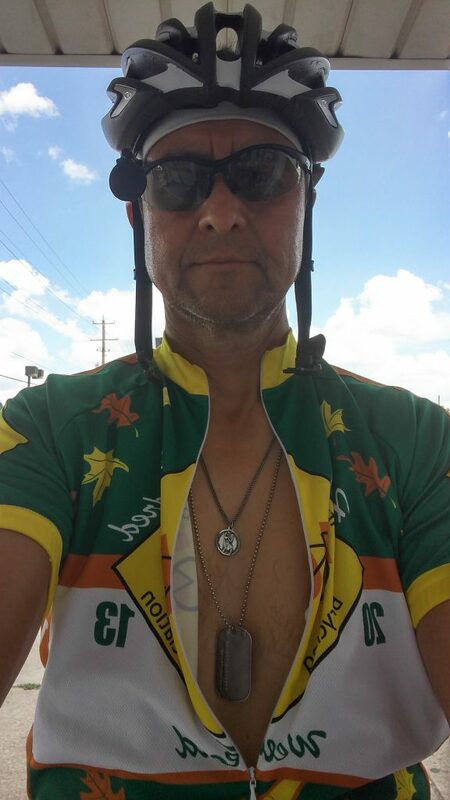 The St. Christopher medal was a gift from my good friend Pete Miller. His dad was part of a bomber crew that was shot down over Germany in WW II. When he parachuted down, the enemy soldiers captured him and were about to execute him, when an officer came up. The officer noticed the St. Christopher medal. He asked if the elder Miller was Catholic. Miller answered yes, and the officer let him live. We are in the process of moving after this journey is done. I came across my Dad’s dog tag when I was going through some other things and decided to wear it for the trip. It was both extra identification and a way to have him travel with me. Especially today, on Memorial day.